Are Debit Cards Secure - Debit Or Credit?Eliminate The Muda! Are Debit Cards Secure - Debit Or Credit? There is a perception that debit cards do not carry the same level of security as a credit card. Recently, on an episode of the Dave Ramsey show he indicated otherwise and challenged his viewers to go look at the websites for the credit card companies if we didn’t believe him. My gut reaction was to believe. While I don’t follow all Dave’s views exactly I do have respect for the man. However, following the philosophies of a Lean Life, I naturally challenge the status quo. I just can’t help it. Every time I dig into any claim or data it seems I can find some fault with it. This of course just encourages me to do so even more. Personally, I have never used a debit card. I wouldn’t even know how to. But, I have observed people many times at the grocery store or gas station entering their PIN number. These transactions therefore are not protected by the “Zero Liability” policy. I’ve stood behind people at the ATM that put one card in after another trying to find an account or credit card that is willing to give them a few more dollars. If stolen, these transactions would not be protected. Admittedly I did not read through all 1200+ results when I searched their site for the definition of “certain commercial card transactions” but this sure does leave a lot of room for liability. Imagine how many different cases might fall under “certain commercial card transactions”. Gambling institutions, houses of ill repute, the pet store or a laundromat could all be “certain commercial card transactions.” Who knows? In looking at the MasterCard website you will find similar “zero liability” language. However they make the distinction a little clearer listing only PIN transactions as excluded from the guarantee. Why can’t debit card companies just be up front and transparent? They know as well as we do that many individuals still won’t care or won’t take the time to learn the true risks they are taking. Most people don’t even read the application or the annual disclosures the banks send, so why not just bury the details in these documents so that at least the few thousand people like you and I who will take the time to read it, can? For those that do care and make an effort to be educated consumers, you can take steps to protect yourself. 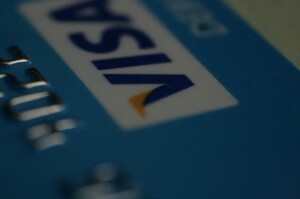 Virtually all debit cards that have the Visa or MasterCard logos are capable of both PIN and signature based use. Under the terms of their contracts merchants cannot prevent you from using the signature method of debit payment. But you must be prepared and know this is your right! Consultants to the retail industry are training companies and cashiers to lead consumers to use a PIN instead of a signature. They are incentivized by lower costs of PIN use vs. signatures saving from 25% to 73% in transactions costs. Their Point of Sale (POS) units, the keypad you swipe your card through are sometimes programmed to simply ask for your PIN based on a file in their software that has the Bank Identification Number (BIN) of all debit cards that are PIN debit eligible. Be aware of your debit cards capability; contact your card issuer to determine if your card will work with a signature. If your cashier or POS unit only ask for a PIN, politely state that you want to use your signature. Don’t take no for an answer, if your card is capable, they are obligated to accept your signature and this will provide you with “zero liability” protection… unless maybe it is at a house of ill repute.